Baytown, Texas – The Mopar Express Lane NHRA Spring Nationals raced into action today. Sportsman racers hit the track on Friday morning for qualifying, time trials, and Stock class eliminations. Racers got more than the bargained for after a schedule change added first round of eliminations to Friday’s activities. By midday Super Stock, Super Comp, Super Gas, and Top Dragster had completed their preliminary runs and moved into final eliminations. The schedule change resulted from a terrible weather forecast for Houston Raceway Park on Saturday. Severe thunderstorms are on the horizon starting Friday night and extending through Saturday afternoon. With four rounds of Sportsman eliminations originally scheduled for Saturday morning, the NHRA had few alternatives other than moving first round to Friday. Saturday’s revised schedule has not been posted. DragChamp’s sportsman event preview provides an overview of each national event and includes our picks to win each class. Follow along as we cheer on our picks throughout the weekend along with all of the racing action as it occurs. Detailed results by class are listed below. After two rounds of qualifying, Craig Gualtierre of Amarillo, Tex. was the number one qualifier with a -.993 under blast from his GT/GA ’05 Cavalier. Gualtierre was followed by his engine builder Aaron Stanfield (-.964) and Dale Hulquist (-.942). Only one of the three DragChamp picks escaped first round of eliminations. Pete Peery picked up a surprisingly easy win after Terry Emmons ran three-tenths over his dial. Brett Candies fell to Slate “Baby Gap” Cummings in round one after taking a .010 to .030 advantage at the tree. The reaction advantage evaporated quickly after Candies ran .159 over his dial. Our final pick, Pro 1 Safety owner and former world champ Jeff Hefler, also fell in round one after losing a close race to Norvell Bowers. David Buckner of Montgomery, Tex. was your number one qualifier in Stock. Buckner posted a -1.117 under 10.433 lap in his D/SA ’09 Challenger. Grabbing the two spot was Bobby Brannon at -1.094 under his index while Brian Massingill was third with a -1.081 effort. Stock Eliminator class eliminations were held at Houston Raceway Park on Friday. Final round results are listed below. With qualifying and class eliminations complete, Stockers will move into final eliminations on Saturday. DragChamp picks to win include Jeff Lopez, Austin Williams, and Slate Cummings. It will be Lopez versus Robert Ewell, Williams versus Dale Hulquist, and Cummings versus Jeff Teuton in round one. With a couple of time trials in the morning, Super Comp competitors moved right into eliminations on Friday afternoon. The field was quickly cut down to 24 competitors. First round winners are shown below. Justin Frost of Fort Worth, Tex. captured the pole position with a near-perfect 8.901 lap. Keisha Moline also nailed the index with a 8.906 pass to move into the second round. DragChamp was three-for-three on our picks after round one. Austin Williams defeated a red-lighting Chase Huffman, Koy Collier won after Mike Owen broke-out, and Chase Murray took a close .004 win over Alan Savage. In round two, it will be Williams versus Moline, Collier versus Frost, and Murray versus Rick Legaux. Super Gas competitors received two time trials prior to first round on Friday. Like Super Comp, the field was quickly reduced to 24 after one round of eliminations. First round winners are shown below. Red hot Cole Cummings made it through the first round along with last week’s Moser Shootout winner Jim Rod Capp. Robert Rowan of Derby, Kan. drove his ’67 Corvette to the one spot with a 9.905 lap. DragChamp picks went two-for-three after Cummings and Val Harmon won. Keith Raftery fell in round one. In round two, Cummings will face John Salter while Harmon will meet Jay Bunce. The Laris Motorsports Insurance team grabbed the top two spots during Top Dragster qualifying. Ross Laris (pronounced La Reese) stole the top sport from his son Holden with a 6.106 lap at 228 MPH. Holden followed closely with a 6.126 pass at 231 MPH. Chassis builder Danny Nelson filled the three spot with a 6.135 ET at 234 MPH. It looks like another great weekend for Team Laris whose already had a stellar 2019. At least one member of their team has been in a final round at each of the first four events they’ve attended this season. After a 1-2 start today, they’ll look to add to the streak on Sunday. Both Ross and Holden moved to the second round along with both DragChamp picks. Aaron Stanfield, another red-hot racer, and JR Baxter will carry the DragChamp banner into round two. Stanfield will meet Bill Swan in round two while Baxter will face off with Danny Nelson. 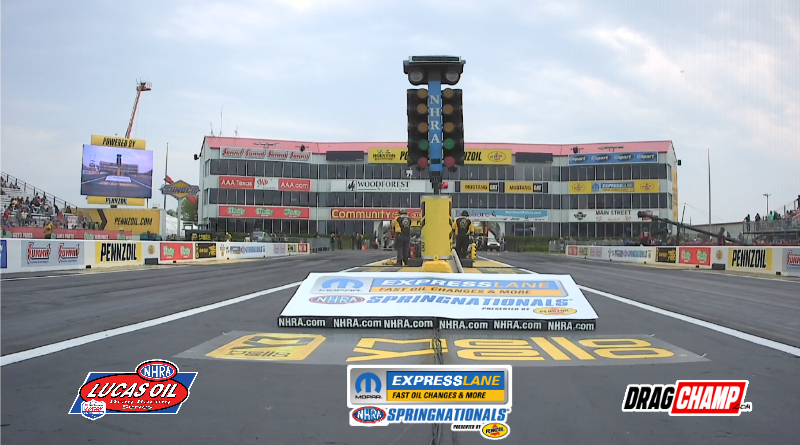 Stay tuned to DragChamp for the latest sportsman racing news from the Mopar Express Lane NHRA Spring Nationals presented by Pennzoil. DragChamp will have daily updates throughout the weekend. DragChamp will be live and in person on Sunday at Houston Raceway Park. We’ll provide pictures and hopefully some Facebook Live interviews.